The non-party organizations which received McDonald’s subpoenas are: Mintz Group, LLC, and LR Hodges & Associates, Ltd., both private investigative firms hired by the SEIU’s law firm; Berlin Rosen, Ltd., a firm specializing in public affairs and strategic communications; and New York Communities for Change, Inc., a nonprofit advocacy organization which has collaborated with the unions in order to organize fast-food workers. The Board majority agreed with the administrative law judge presiding over the case that these non-parties did not have to produce any documents whatsoever, regardless of the fact that these organizations were union allies. McDonald’s subpoenas to the unions were for documents concerning: (i) the unions’ internal organization, structure and finances, including the SEIU’s role in the creation of the worker organizing committees which are charging parties; (ii) the unions’ organizing strategy and activity; (iii) the protected, concerted activity and union activity of all employees at the franchisees’ restaurants. For reasons explained below, McDonald’s specifically subpoenaed documents from the unions relating to McDonald’s “brand,” including “brand-related” communications with each other, the NLRB, and the PR firm Berlin Rosen. All documents regarding the actual protected, concerted or union activities of the individuals named as alleged victims of discrimination in the Consolidated Complaint, but not documents concerning such activity of other franchisee employees. All documents showing the public activities engaged in by the unions or by employees of McDonald’s and/or its franchisees in connection with the unions’ organizing campaigns. However, material involving internal matters that are unknown to the public, McDonald’s or its franchisees, need not be produced. All documents made available to McDonald’s, its franchisees, or the public in connection with the unions’ campaigns. As pointed out by Board Member Miscimarra in his strong dissent, the majority decision means that the unions must produce “only those documents reflecting public information that [McDonald’s] would already know or that it had previously obtained.” He pointed out that this is contrary to the purpose of the NLRB’s subpoena rules, which enable parties in NLRB cases to obtain documents that would otherwise be unavailable to them. This ruling could significantly weaken McDonald’s ability to prove its alternative “brand protection” defense. McDonald’s primary defense to the joint employer allegation is that it did not exercise the requisite degree of control over the franchisees’ employment policies, practices and decisions to be deemed a joint employer. 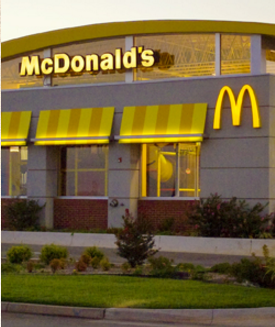 However, McDonald’s has an alternative defense based on a NLRB case precedent holding that a franchisor and its franchisees are not a joint employer when the control exerted by the franchisor over the franchisees is “no greater than necessary to keep the quality and goodwill of the franchisor’s name from being eroded” or is to “best preserve, maintain and enhance the reputation, trade name and good will built up for the franchising system,” and control “has been retained solely in an effort to maintain the uniformity of the integrated enterprise for the mutual benefit of [the franchisor], . . . and the . . . franchisees.” McDonald’s would contend that any control over the franchisees is limited to such brand protection purposes. However, the General Counsel is alleging that McDonald’s control goes further than this. Member Miscimarra, persuasively in my view, argues that the unions should have been required to comply with the subpoenas because a question relevant to the brand protection defense, in his view, is whether the documents would or would not support McDonald’s theory that the unions were engaged in an assault on its brand. However, the Board’s decision forecloses that possibility. The Board’s decision is at 363 NLRB No. 144 (March 17, 2016) and can be found here. The judge’s decision on this and other issues in the case (she previously decided that the single employer issue would be tried before the underlying unfair labor practice charges, as requested by the General Counsel and the unions), together with the current composition of the Board – three Democrats and one Republican (there is one vacancy) – do not bode well for an outcome favorable to McDonald’s if the case ultimately comes before the current Board for a decision on the merits. However, it is not out of the question that this case could take so long to resolve that it would come before a future Republican dominated Board for a final decision. The case is proceeding at a very slow pace. It has already been a year since the case was assigned to the judge for a trial. A lot of time has been consumed in the previous and current special appeals to the Board, as well as in litigation in the federal district court in New York regarding subpoenas for documents served by the NLRB’s General Counsel on McDonald’s and its franchisees. It is doubtful that the current vacancy on the Board will be filled before the November Presidential election. The term of member Hirozawa, a Democrat, expires in August of this year, but even if the President nominates him for a second term, the Senate is unlikely to act on his nomination before the election. While President Obama could try to use his recess appointment power to appoint two Democrats without Senate confirmation before he leaves office, the Senate can avoid this possibility by staying in session. This gambit worked in early 2012, as confirmed by the Supreme Court in its 2014 Noel Canning decision, which held that the President’s 2012 recess appointments of two Board members were unconstitutional because the Senate was not in recess at the time. If a Republican wins the Presidential election and the Republicans retain control of the Senate, we could see two Republicans nominated and confirmed to fill these vacancies, which would give the Republicans a Board majority. The term of Republican Member Miscimarra will expire in December of 2017, but he could be reappointed, or another Republican could be nominated to replace him. While it wouldn’t be a sure thing, McDonald’s chances before a Republican majority would be far better than they are now.